Two very special books from Steele Roberts have recently crossed my desk and as I browsed through them I marveled at the consistent quality that this small publisher manages to achieve while often publishing in the most difficult publishing areas, from an economic viewpoint, e.g. poetry and short fiction. Have a look at their excellent website for a full list. Exquisite, charming, satisfying and captivating are the words to describe this compact book. It is simply a treasure. Campbell Smith was a sometime director of the Waikato Museum of Art & History, and I gather he is something of an elder statesman of the arts community in the Waikato. His work is in various collections around the country including the Te Papa collection. Dr.Ann McEwan taught art history at Waikato University for 10 years before becoming an independent art historian and heritage consultant. She has done a fine job here putting together more than 80 of Smith’s most appealing images as well as providing a useful and interesting introduction. She has also provided a Campbell Smith Timeline , an annotated catalogue and an index. Campbell Smith has also added a personal touch with a five page account of his life and the major influences on his development as an artist. The two engravings below are Waikato Wetlands, and Bridges of Hamilton City. 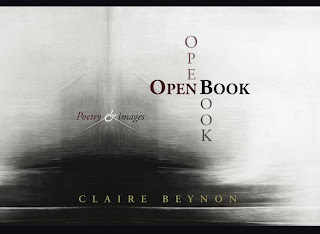 This is Claire Benyon's first solo collection of poetry, bringing together her words and images. She is a fulltime Dunedin-based artist and writer who has exhibited extensively in NZ and overseas. She emigrated to New Zealand from Cape Town in 1994 and early on in her stay became a New Zealand citizen. She won the Open section of the 2002 NZPS International Poetry Competition, and her winning poem is included in this stunning. large format hardback book. Her publishers has done her proud. From the beginning, OPEN BOOK insisted on its own timeline – walk, don’t run is what it seemed to be saying. Several years in the making, the process has kept me captive and ultimately convinced me that the circuitous route almost always brings in some elusive essential for resolution. Astonishingly this fine publication seems to have been done without financial assistance from Creative New Zealand, or any other funding body for that matter. Open Book is, sigh, wonderful. The artist's images compliment her poems beautifully, and Claire's warm and witty poems have been placed with such care and form on the page. Even the paper they've chosen is yummy and asks to be stroked. This a book that mustn't be left languishing in a bookshelf, hidden. It begs to be left out on the table, or by the bed, to be dipped into, admired and enjoyed. Thanks Vanda. Beautifully put, and I totally agree. Greetings Bookman Beattie, Roger Steele continues to make a luminous and tireless contribution to local publishing. Which is why it is so puzzling and troubling that he received no Creative NZ funding this year for seven great submitted projects. Multi-national publishers with batteries of staff meanwhile hoovered up these taxpayers dollars. He is eating pumpkin (literally) and now poised to go under. Please investigate - and expose! Some of the artwork for these are truly beautiful. Certainly books to keep well preserved in storage after a once-over. So much history that ought to be passed down through the generations!